Air: A person can go without air for only a few minutes. Water: A person can survive without water for up to three days. Food: A person can go without food for up to three weeks. Let us firstly assume that the air is not contaminated and that you can breath safely. This leaves us with water and food. Water is considerably more important than food for our ability to survive a reasonable length of time. This means that having a supply of safe water is essential to surviving a sustained crisis situation. When it comes to water storage, you have basically two options: 1) buy bottles of water to store or 2) store tap water. The first option is the most convenient. But, if you are to store enough water to ensure your entire families survival over a sustained period, then this will be expensive. If it's stored properly, tap water is every bit as good as bottled water and, of course, it costs a lot less. Buy plastic containers which can be found in most stores. Be very careful to make sure that they are appropriate for water storage: if not, there is the risk that chemicals will penetrate the container and contaminate the water. Start collecting your soda and water bottles and build up your supply. Glass bottles are also safe, but are more difficult to store and too easily broken. Prepare the container for use by carefully wash the container and let it completely dry before filling it. Add some chlorine bleach, or hydrogen peroxide (about ten drops per gallon of water). This will kill most microorganisms, without having too much impact on the taste. Fill the container completely to the top, to force out all air. Store the water off the floor, in a place where it can't freeze (frozen water will expand and break the container), away from direct sunlight, and away from chemicals. No matter how much water you store, in a sustained crisis, you risk running out. For this reason, it's important that you have the means to purify more water. There are some water-purification chemicals available and even simply boiling it can be effective. 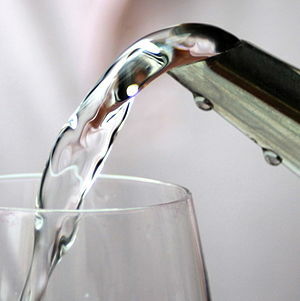 However, the easiest and most reliable way to make water safe to drink is by using a water filter. The most common filters are ceramic filters impregnated with tiny quantities of silver that kill off harmful bacteria. Some ceramic filters are operated by hand-pumping action. A hose is placed into the unfiltered water, and the purified water exits via a spout into an appropriate container. Others rely on gravity. Two thermos jugs sit on top of each other. The dirty water is poured in the top one and the filtered water drips into the bottom one. Some filters are a combination of a ceramic filter with a carbon filter that removes dangerous chemicals. On my other blog, Prepare to Survive in California I wrote a pretty big article about Zero water filters which I purchased at Home Depot: Testing the water...so to speak. Always have a back up plan and practice your plan when ever you can.